The time of renewal has come, the time for the galaxy to come to know the Necrontyr, and to fear their reawakening. Deep in the bowels of the world of Paragon VI an ancient intelligence stirs, a power immeasurable to the galaxy today, a power seeking a return to its former days of glory. 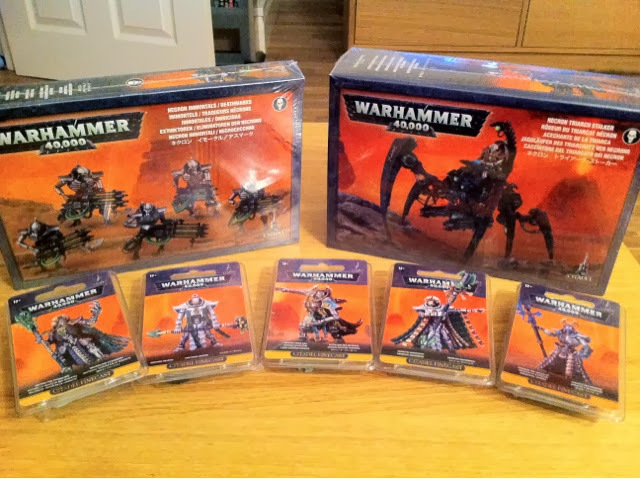 Here begins the tale of this reawakening, of the unstoppable march of the Necrons of the Sobekhotep dynasty. Hi all, and welcome to random Wednesday, and today I'd like to say a few words about what we've come to know as mathammer, or in other words the process of judging a unit by its mathematical killing power based on the probabilities of achieving kills against a particular type of target, usually marine equivalents (T4, 3+Sv), guard equivalents (T3, 5+Sv) and terminator equivalents (T4, 2+Sv). Now I don't want to give the impression that I think mathammer is rubbish, but I do think there's a tendency to over rely on it when picking an army list. 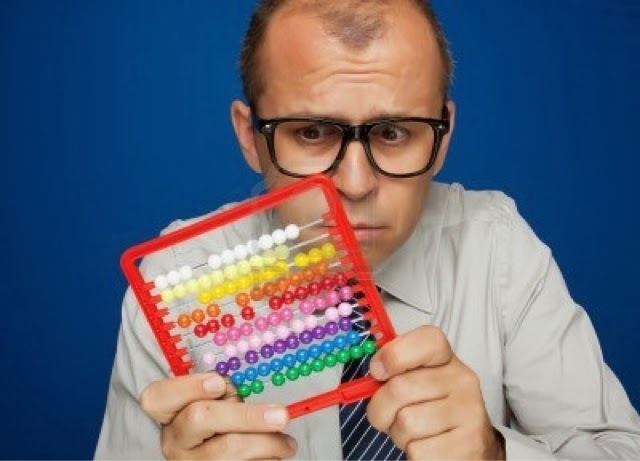 Look on any forum and you'll often see comparisons of troops and weapons using mathammer, resulting in a recommendation for one or the other, because on average it causes more kills. That's great, and in absolute terms I can really see the benefit to such an analysis, even breaking it down further to establish a kills per point ratio. I don't agree however that mathammer is the only way to assess effectiveness, nor do I think it's actually representative of a unit's actual efficiency. 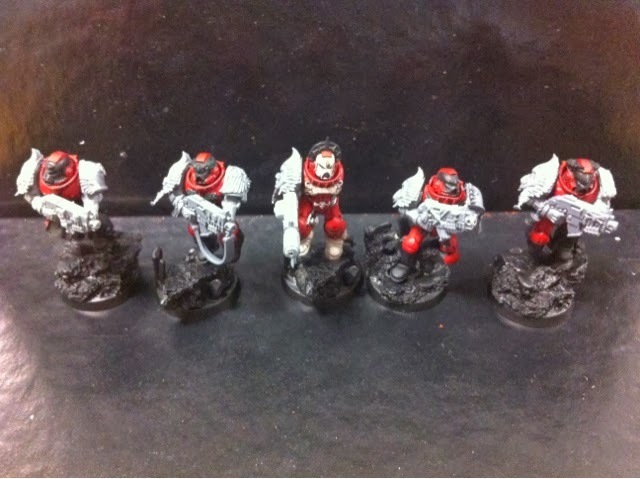 Let me elaborate on this point therefore, using a 10 man space marine tactical squad with bolters shooting at another marine squad as an example. Within 12" - 20 shots, 13.3 hits, 6.67 wounds, 2.2 kills. So what that tells us is that realistically we can expect on average 2 dead opponents in a turn's shooting. Already therefore we're seeing the failings of mathammer, because we've just discounted 0.2 kills to get a realistic assessment of the likely damage. My own approach is to look more at the level of firepower required from a certain type of weapon to inflict a certain level of damage, so using the example above I would say that in order to cause those 2 unsaved wounds, I would need to cause 6 wounds before armour saves, and therefore 12 hits, which would similarly require 18 shots. Here's where you can clearly see the difference therefore, in that mathammer would tell you that you will cause on average 2 casualties with a full squad. My own approach tells me that a squad of nine marines will on average (4 times out of 5) cause exactly the same amount of damage, which saves me points to spend elsewhere. Alternatively, this approach can also be used to assess the firepower required to cause complete wiping out of a unit, regardless of range. Using the previous example in order to achieve complete elimination of a ten man squad you need to cause 10 unsaved wounds. This requires 30 wounds to be caused that allow armour saves, which in return require 60 hits to cause the wounds necessary. Those 60 hits require 90 shots to be fired. I can, using this approach, figure out the level of firepower I'm going to take to cause this level of damage. My approach tells me that 9 full squads outside rapid fire range would be required. Mathammer gets you there too, but the big difference is that my approach cuts out the '0.3 of a kill' that pure mathammer can leave you with. My second concern with mathammer therefore is that it only looks at pure damage dealt, and cannot take into consideration other things such as gut instinct and threat that units can provide over and above their pure damage dealing ability. 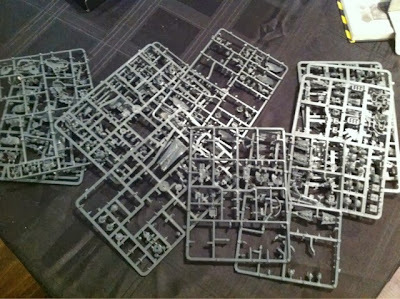 Resilient units therefore add to the consideration, take for example dark eldar wyches. They have the potential for significant damage dealing capabilities, particularly against lightly armoured foes, however their average toughness and minimal save mean that their combat effectiveness is drastically reduced, as they are very likely to take significant casualties before getting into combat. Conversely, terminators actually have a relatively modest damage potential, due to their low number of attacks, but they are able to apply those attacks turn after turn due to their resilience to damage and as such their usefulness is multiplied. Thirdly then, a unit's effectiveness can come from its synergistic effects. A prime example would be Dule Sliscus from the Dark Eldar codex. This character in terms of pure damage dealing potential is relatively minor when compared to many, however his ability to influence the combat drugs used by the army as a whole, plus the boost to the potential of a unit to which he is attached mean that he is significantly more valuable than the mathammer figures alone would suggest. Finally then, the matter of the threat posed by a model also cannot be considered by mathammer alone. Here I'll consider Abaddon, though this element can be applied to many other choices within an army. 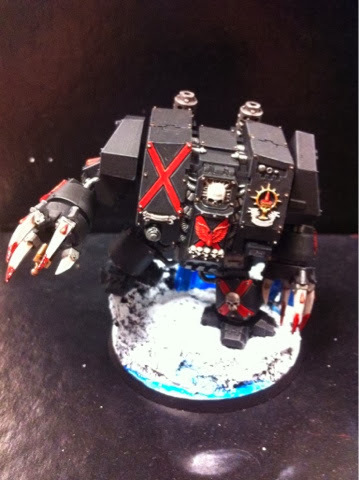 I can't imagine many people ignoring the master of the Black Legion if he's on the table, in fact many, and I count myself among this number, would actually dedicate a disproportionate amount of effort to removing him from the field. Other situations that fall within this category could include infiltrating units forcing heavy weapons to move out of range and thus not fire, with the infiltrating unit not necessarily being capable of significant damage but its usefulness being amplified by the prevention of damage being caused to its own army. In conclusion therefore, I support mathammer as a purely theoretical vehicle for calculating the likely damage output of a particular unit or weapon loadout, but I would strongly counsel caution against using it solely to assess a units effectiveness. In fact, I often discuss selections with my clubmates, the philosophical question of 'what's more scary' being very useful for giving you an opponents view (providing you trust them not to bluff you of course!). Player Type: Give me the ball, give me the ball, GIVE ME THE BALL!!!! The Runner (I’m sorry, I refuse to call them catchers) on the Norse team is probably one of the most underrated players in this team of specialists, simply because you’ve got two Ulfs, two Beserkers and the Yhetee taking all the spotlight. The Runner however is your best option for scoring touchdowns, and don’t let his stats or anyone else tell you different. Well as with all Norse he’s got below average armour, by now you should know that taking the dodge skill is priority one for mitigating against that (unless you roll an armour increase with your first skill of course!). Really though, the Runner should be the easiest player to mitigate armour with, since he should be carrying the ball, and therefore should be screened off from your opponent’s players most of the time. If your runner is getting hit, things aren’t going well for you! Well you don’t really maximise Block on a Runner particularly, it’s more of a safety net since you can get away with Blitzing with him if your opponent is blocking your route to the endzone. Most receivers or ball carriers don’t come with block, so don’t take the offensive strategies with their ball carriers in the same way, which is exacerbated by them generally being lower strength as well. Dauntless works in a similar way, this guy isn’t someone you particularly want to be blocking or blitzing with too often, but if you’ve got a big guy in your way, Dauntless helps you get him out of there to clear your path. It is a useful skill to have defensively as well though, since if your opponent manages to give the ball to a strong player, Dauntless is your best bet for getting it off them. Finally, this is the only player in your team with easy access to agility skills. They’re very important to you being able to score touchdowns, and so you really want to protect this guy more than anyone else on your team. Once you get them, you need to start using them to score touchdowns and once the runner starts to skill up you can spread a few around to other players, but not until he’s got at least two skills. Do you start a league with one? I would, though I can see an argument for taking your full complement of Ulfs and Beserkers instead. There’s very little difference at the start of a league, but the more time you take to skill up a Runner the more difficult it is to get them there later when other teams start building skills. What skills can they take? As I mentioned already, really he’s going to be screened most of the time, so you shouldn’t need too much in the way of defensive skills, dodge should suffice. Give it to your Thrower, if you haven’t taken one then you might consider it. Worth thinking about, the Runner’s movement of 7 is decent, but a three square boost on the kick off never hurt anyone. Probably most useful if you’re thinking of building one guy to fetch the ball and another to score with it. Probably the only player in the Norse team I’d even consider giving pass block to, but even then his average agility makes it a slim chance at best, worth thinking about if you get an agility increase early. Ok so we know by now that I don’t like Pro much, and to be honest, the Runner can take all the skills he needs to get guaranteed re-rolls so Pro is a poor attempt at a general backup. The best option for taking this skill in the Norse team, I’d still probably leave it in the box to be honest unless you really can’t think of anything else to give them. Best taken on the Beserker, who’s more suited to retrieving the ball from an opponent carrying it, it’s a wasted skill slot on a Runner. You remember that ball retriever I mentioned earlier who got given Kick-off Return? Sure Hands would be my second choice for that situation. Still better on your Thrower though. Shouldn’t really be blitzing or blocking too much, and when he does, the Runner should be just as happy with a pushback, as it clears space for the race to the endzone, so don’t do it. No, definitely not, the Beserker fetches the ball, you don’t want any situation where you could be knocking yourself over and dropping it, which is what happens if you have this skill and your opponent has block. If you plan on passing the ball to him, then this will be a must, though for reasons I’ll explain in a moment, it wouldn’t be my first choice skill. This is. With Diving Catch you will be taking accurate passes on a 2+, and can always use a team re-roll if you fail that until you get Catch. The vital difference though is that Diving Catch lets you attempt to take inaccurate throws, kick-offs and throw-ins that would land (not end up, land) in an adjacent square. You won’t get the +1 modifier for it being accurate, but any chance is better than none! This would be my second favourite skill on a Runner. Leave it here for the Beserker to take, it’s a very useful skill but I prefer to keep my Runner skill slots for offensive options. Priority number one, take this skill first above everything except an agility increase. This becomes a very useful skill if your Thrower starts to get good at passing, since it lets you threaten the endzone from a decent distance away even if you start the turn on the floor. Like this, however much you screen your Runner, at some point they’re going to get blocked. Side step means you can use the full width of the pitch to your advantage, and if you only get pushed back, you can actually get yourself within striking range of the endzone, bonus! You’re not fouling with your Runner are you. No, you’re not. Leave it here. Worth a pop if you get to that fourth/fifth skill, a Norse runner with 10 squares of possible movement? Yes please! If you take Sprint, then yes, if you haven’t then you shouldn’t fail enough to need this skill. What are good options for doubles skill rolls? If you haven’t taken a Thrower and are using a Runner to retrieve the ball, this is worth considering, provided you’re passing and not handing off, but then if you’re doing that you’re in dire straits anyway! Frustrates your opponent massively, they put everything in to get that blitz on the ball carrier, who then slips the ball out of the back door to the other Runner who’s nearby. It’s a risky play though and works better on higher agility players due to the likely number of tackle zones. Absolute gold if you pass the ball a lot, since tackle zone modifiers make a mess of your attempts to catch the ball. That Runner you’re using instead of a Thrower? Give him this if you can. Worthwhile thinking about since it counts as a pushback instead of a both down, so lets you continue that run to the endzone. Still not using a Thrower? This will help. What are the best stat increases to take? Agility or movement, either is very important to this player, but leave the others at home and take the skills instead. What are the best skill combinations? A fully developed Norse team should have two Runners, I’d be tempted to skill one up as the classic Runner and the other as the Spoiler, who’s just there to make everything your opponent does just that little bit more difficult. Under no circumstance though should you risk them unnecessarily in a melee – unless the ball is available, or your opponent will definitely score next turn then keep them out of the soup! 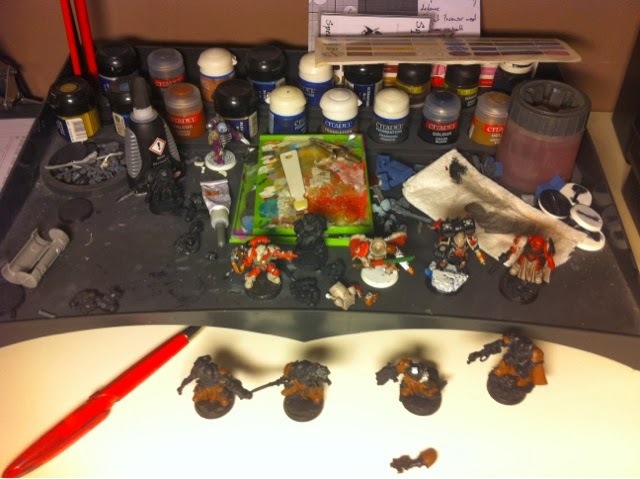 Here's my Monday painting update for you all, as feared I didn't have quite so much time this week for painting and modelling progress, largely limited to a few hours on Friday evening. 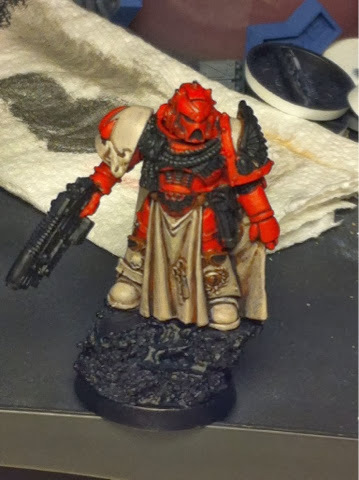 I still managed visible progress however, and got the base couple of coats of red on a combat squad of tactical marines. 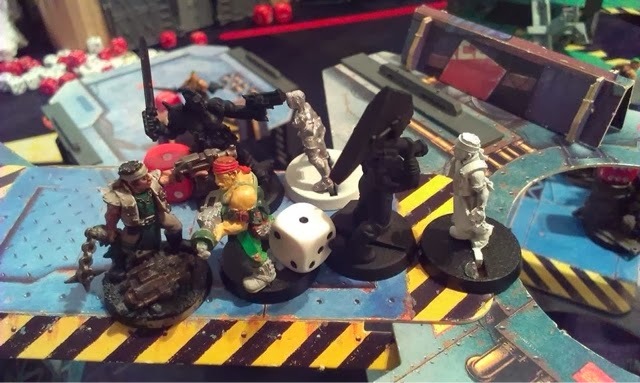 Hi all, I've got a special post for you here, following on from a great game of Necromunda I had on wednesday evening. First up, my gang rating was two points higher than Tonka, my opponent, so he got to choose the scenario and he plumped for ambush from the original rulebook. That meant I was going to be in the firing line from turn 1. Importantly, we both agreed that given how long games take to set up, we didn't want either gang bottling early, so agreed a house rule that no gang can bottle out in the first turn, even if they wanted to. Probably a good thing, as both my heavies and crank, one of my BS4 gangers all went down early, falling off the walkways they were standing on at the time. Ouch, three down in the first turn, I needed to pull some casualties back, and quickly! Fortunately, my guys didn't let me down, and the next six casualties were all down to the Death Spectres with Hawg, Boone, Brew, Maggot, Weasel and Butcher all picking up wounding shots or strikes. Of those, Weasel was probably the most impressive, taking down a Goliath heavy in close combat. 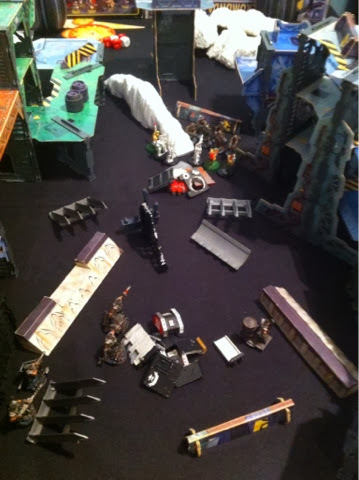 At this point, things became even more messy, with a large combat erupting in the centre of the table as Butcher led Stumpy and Shock into a scrap with Rottmayer, Anon and Dr Hesse. Butcher quickly dispatched his opponent, and though he wasn't quick enough to prevent Dr Hesse from knocking out Shock, he was able to watch on as Stumpy took down Anon, who was toting a truly vast axe, before downing Dr Hesse as he turned tail and ran from the combat. 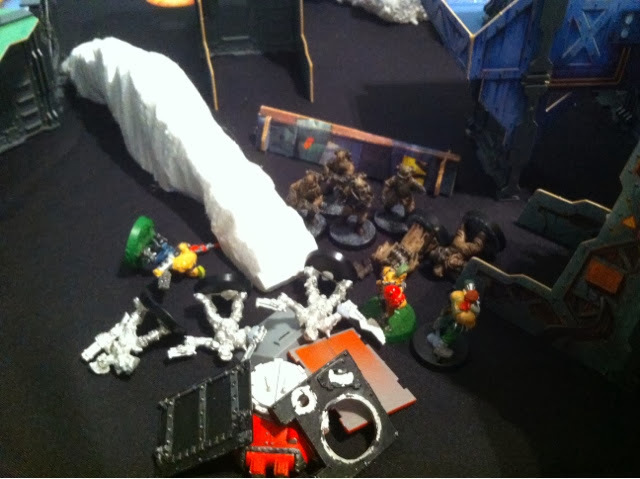 Hawg pulled off a master stroke, despite already suffering from a flesh wound, he loaded his last scatter shot round into the breach of his trusty shotgun, the blast spreading out to wound both Danko and Cane, and with that, the smash mob decided enough was enough, and they broke off their attack and vacated the field. In doing so however, they took with them two captives, both Weasel and Boone having been dragged away by the Goliaths. A resounding victory then, with only one casualty standing between me and stealing a territory from Tonka's gang (though we checked afterwards and it would have just been old ruins, so I'm not too disappointed). Three games in and I'm really starting to see the benefits of the advances I gained early on, supplemented by some increases this time too. Boone is now BS5, Hawg can now Rapid Fire with his shotgun whilst Butcher now boasts 3 wounds. Brew is able to Rapid Fire his autogun at BS4 and Weasel is seeing the benefits of lifting weights, with his strength and initiative both now up to 4. Maggot has improved his aim to bring him to BS3, and Stumpy took a big step picking up 4 advances this game to learn the step aside and parry skills, as well as reaching Toughness 4 and Leadership 7. That leaves me with 4 members at BS4 or above, 3 gangers have T4, and I've got a bit of bottle resilience with two gangers at Ld8 in addition to my leader's Ld9. Next game is the 3rd December and we should hopefully have 4 or 5 gangs involved on that occasion, so watch this space! Distrac...ooh look, new plastic crack! Hi all, ready for today's random musing? I'm betting you won't read all the way through cos today I'm talking about distractions. Hi all, less quantity for this weeks painting update, but hopefully the quality is pretty good, I've been working on the dreadnought for my bloodstone knights, specifically a Soarta dreadnought (death company to the uninitiated). 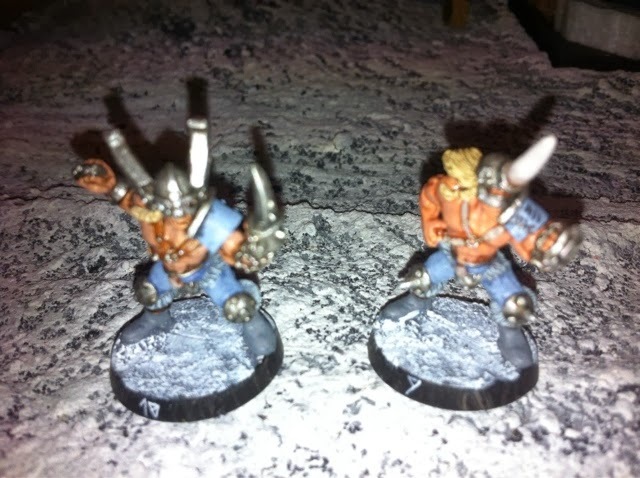 I have another bloodbowl match report for you from this week, when my team of Norsemen took on an inexperienced team of Orcs in the MAD League. Now my Norsemen were sitting at the top of the league clear by a point at the start of the night, though they'd played two games more than their nearest rival. That rival was also playing, against a team of high elves who'd held me to a draw, so it was vital that at the very least I matched their result if I were going to stay at the top. So what's your favourite colour to paint with? It must be Wednesday, I'm feeling a bit random today, so I figured i'd talk about a subject that's close to my heart, painting. On the face of it, your Beserkers seem to fulfil a similar role to the Ulfwerener, indeed in earlier editions of the rules you could take 4 of them and Ulfs didn’t exist. There are significant differences between the two however and whilst their roles overlap to a point, if you try to play a Beserker like an Ulf then be prepared for them to die on you! The Norse Thrower is perhaps the most debated player on the roster, particularly in terms of whether you need to take one or not. He has access to skills that make a certain playstyle possible that no other player can really give you, but his unreliability at the start of a league means he’s not an essential in your lineup. Well their biggest weakness is that early on in a league, they’re not particularly good at doing what they’re there for, ie picking up and throwing the ball! And I mean really not good – even an orc thrower stands more chance of getting hold of the ball than the Norseman, and that’s never a stat you really want to think about. So how do you mitigate this? Well there are two methods really, the first is my preferred solution and that’s not to use the Thrower as such for the first few games until he gets an increase – I don’t mean put him on the line of scrimmage, but he’s going to find it fairly difficult to complete passes early in a league (1/3 chance of failing to pick up, 1/3 chance with a re-roll of failing to throw an accurate pass and 1/3 or worse chance of the receiver not catching it, statistically speaking you’re going to have to use a re-roll there somewhere and that’s not really a situation you want to be in). Consequently, use him as a slightly slower runner, or a backfield defender for the first few games. You’re really looking to get him to 6 SPP’s as quickly as possible so that you can give him either accurate or sure hands (or even more, hope he gets an AG increase) to make him more reliable in the throwing role. That’s not to say don’t throw the ball at all in the first few games, or if you need to to avoid getting scragged, but don’t throw unnecessary passes, and if you can get him to the endzone once or twice, that’s really going to help you a lot. The second method is to save your re-rolls for the passes. The Thrower gets an inbuilt one for the pass itself from his skill set, but that still leaves picking up and catching as two real issues for him. Ideally you can throw a quick pass if no-one else is around, but I recently tried this whilst playing Skaven and watched in horror as what I thought was a safe option resulted in a Gutter Runner stealing in and grabbing an opportunistic touchdown. You can get away with saving re-rolls like this a bit with Norse since so many of your blocks in early games are fairly safe due to the presence of the block skill on most of your players. Be aware though, that your Ulfs might need it as well, so pick which is more important and do that action first. The two weaknesses I identified above therefore both have the same long term solution – skills and/or an agility increase. Take sure hands first to give you another re-roll chance, then Accurate, Strong Arm if you get a double and if you can take an Agility increase then do it whatever else you might have access to! No-one else in your team can take passing skills without rolling a double, and they’ve all got their own specialisms to concentrate on if they do, so if you fancy ever having to pass the ball with a norse team, you’re going to want the Thrower to do it. The Thrower actually becomes an extremely important and useful part of your team once he’s got those early increases though, completions come easier and the SPP’s start to flow more regularly and you can threaten the opposition much more with your runners, who equally can become more deadly as receivers. The skill build of your Thrower therefore is the key to maximising his strength, and by taking the right skills you can really make an efficient player. Interestingly, the Norse team Throwers actually make probably the fullest use of the Passing skills available to all teams – most others really don’t like their Thrower to get in the mix, but with the Norse, you can quite easily take Nerves of Steel, Dump Off, Hail Mary and Safe Throw to build a Thrower who’s not afraid to go where the wild things are and get the ball out of there. Depends on your tactics, I started my most recent league with two, though one died in the first game, and personally I think they take so long to build to a good level that you want to maximise their chances of getting SPP’s early on. I wouldn’t criticise anyone however for playing a Norse team without a Thrower, and actually the Norse are perfectly capable of managing without a Thrower at all if you choose to play that way. Meant for hitting stronger players, and whilst there is some merit in giving it to the Thrower who’s going to get the ball out of the dirty places, it’s not essential, particularly since you can’t blitz and pass the ball in the same turn. You’ve got this by now haven’t you, Dirty Player goes on a lineman, not a specialist. Fend is an interesting skill to consider. Most would take it as a defensive move to prevent an opponent from following up a pushed or downed player on the line of scrimmage, but actually if you think about it, Fend is ideal for a Thrower who’s in the line of fire – if your opponent manages to get the block on him but fails to knock him over, then fend means you’re in the clear next turn to move and pass without a tackle zone hampering him. As such, I would certainly think about taking this skill a bit later in development. No. For similar reasons to the above, if you do have to block/blitz with your Thrower, you don’t want him to then have to follow up and block again if you’ve managed to get clear of tackle zones. Definitely worthwhile on a Thrower, though probably around skill number 3 (unless you’ve got two, in which case give this to one of them first and only use him on your opponent’s drives). It makes it much easier to control your opponent’s position and drive if you can more reliably put your kick deep into their half. This would be worth considering once you’ve got a Thrower who will pass the ball on your drives, he’ll get to the kick off quicker, possibly even giving you a free attempt at catching it to save that tricky pickup, but his basic movement of 6 means if the kick-off lands deep in your half, retrieving it otherwise can take up most or all of your movement. You’re unlikely to be using a Thrower to intercept a pass at the throwing end, and although you should be trying to get into such a position at the receiving end, more than likely you’ll normally have your Thrower between the receiver and the endzone. Norse also don’t have the agility or skill access to make interceptions worthwhile in my opinion so taking this skill is a waste. Not sure why you’d take Pro on a Thrower since they have access to Leader as well, which allows you that re-roll automatically. You’ll see later that the skill builds for the Thrower don’t have enough gaps to justify taking Pro. Nope, as with most Norse, he’s not quick enough for it to count. Now for the ‘defensive’ Thrower who’s got Kick and will be your last line of defence, Strip Ball could be magical. Further on in the league though, a lot of receivers will have taken Sure Hands by then and its usefulness is negated. One of the first skills I would take on a Thrower, giving you an automatic re-roll to pickup. It doesn’t make it a certainty, but 89% is a damn sight better than 66% when it comes to success at picking the ball up. Defensively speaking, tackle is gold. Most receivers will have the dodge skill, and a lot of them have block after a few games, so Tackle on those players who are going to have to make that last chance hit is crucial, it means an additional 17% on your chances of knocking them down, and thus freeing the ball. Similar to tackle really, wrestle is to my mind very important to have available to the last line of defence, since it again negates one of the block dice results that a skilled receiver isn’t afraid of. Of course it’s benefit is negated if that receiver has taken jump up, but for anyone carrying the ball that means they’ve then got to pick it up again, which means potential for failure. Up there with Sure Hands as my first two picks on a Thrower (at least one who’ll actually be handling the ball and passing it). Accurate makes it so much easier to get an accurate pass, which in turn makes it easier for the receiver to catch it, which is kind of what you want from someone throwing the ball! This would be a skill I’d definitely consider taking on a defensive thrower, if he gets in and either blitzes a ball carrier or picks it up from a melee then having dump off so he can get it out of there if anyone blocks him next turn is a serious advantage. Similar to dump off really, the Hail Mary Pass is demoralising for your opponent, all they need to do is get the ball to score, but your Thrower nips in and flings it to the other end of the pitch for your runners to fight for – it’s a last-ditch tactic but one that can pay dividends if used correctly. Who would like a re-roll for 20k? Yes please, the only problem is there are so many skills I’d like to give a Thrower before this, that I’ve never got round to using it. Defensive Thrower who discounts tackle zones when Throwing or Dumping Off? Sold to the man in the furry boots with horns on his helmet! Interceptions are rare. Very rare. Really annoying though when they occur, and even though it’ll probably fail when you really need it (it’s only a 50% chance after all) Safe Throw is always worth thinking about. As with some of the other skills above though, I’d take others in preference leaving this one till late in development. Jump up is always good for anyone who’s going to be playing near your endzone, and almost(!) negates the point in your opponent knocking them over in the first place and risking an attacker down result. Excellent skill, and really boosts your Thrower’s range. Becomes magical if you also have either accurate or AG4 by this point. Definitely my first pick for a double. Agility, all the way. Ignore everything else in favour of skills. The Thrower isn’t a necessity in a Norse team, as really they’re most suited to the running game anyway, but with a couple of skills they become good enough to be worthwhile, and if you’ve got options, you’ve got a Plan B, and if you’ve got a Plan B then your opponent had better have a Plan C, which a lot of coaches don’t since their teams are designed to do one thing and one thing only. A lot of advice on Norse teams will tell you to take skills like Fend to enable you to keep away from opposition blockers as much as possible to avoid injuries. I can’t tell you how wrong this is to the Norse philosophy I play, it’s pretty much diametrically opposed to everything I think you should be doing with these guys. 1-die block (assuming any result that knocks over your player is taken). Norse knocked over 1 in 3, Human knocked over 1 in 2. Injuries are the same, meaning from a 1 die block, chance of a Norse lineman ending up off the pitch is 6%, whereas a human lineman is 7%. With MA6 and average ST and AG stats, there really aren’t any other downsides to the Norse lineman, with the number of specialist positions the Norse have available to them, you don’t even have to take that many (If you have a fully specialised team, you need to start with 2 linemen on the pitch). What these guys really excel at is hitting stuff (in comparison to most linemen), they’re an odd combination of low armour players who actually like to scrap. The important thing to remember though of course is that they don’t much like being knocked over. One of their key strengths is that they start with the block skill, so have an advantage on most other line players right from the start. You can really maximise their strengths therefore by blocking with them, knocking opposition players over and gaining numerical superiority over your opponent. You can even take a bit more of a chance with these guys than most other linemen, by making 1-die blocks as the chance of falling over yourself is only 1 in 6. I’d strongly advise not rolling these till the end of your turn though, or if you’re desperate. Ideally, try and outnumber your opponent at one end of the Line of Scrimmage, to let you block all the way down the line with two dice. If you do that, you should see that several of your opponent’s players start the turn on the floor, and that limits what they can do, if only because it slows them down a lot. I mentioned earlier though that you have two types of linemen. On your drive is where you use your skilled players on the LoS. Their biggest advantage is that they start with block, meaning you’re only 6 SPP’s away from a second skill, and you don’t need to worry about taking block. A lot of advice you’ll get will say take Fend to help them stay alive, but this is your offensive line, so I say take skills that will help you put the other guy down, by which I mean Frenzy, then Tackle (or vice versa). You’ll rarely see advice advocating taking Frenzy, and I’ll agree it takes a bit of experimentation to get its use right, since you could potentially be following up a block into a crowd of players such that your opponent gets to choose the dice result, but the ability for your LoS players to block twice, potentially with two dice on each occasion, is magical in terms of clearing the pitch out. 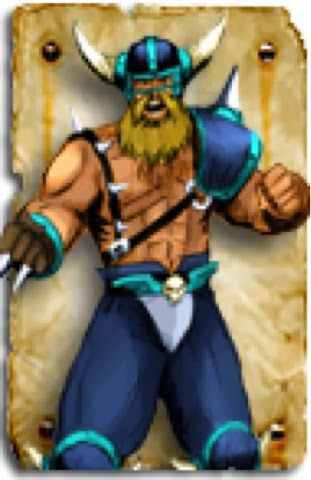 Throw in some support from your Ulfwereners (more on these guys in another article) and you have a LoS that will scare most opponents. The second main strength of the Norse lineman is as a result of the team makeup, and that’s that you don’t need to start many of them each kickoff. Norse teams come with the option of up to 9 positional players, all of whom can be useful on both offensive and defensive drives, and what that means is that specialising your linemen is extremely practical. You’ll have seven linemen if you max out your team, meaning that you can create 3 defensive fodder players, 3 offensive blocking players, with one spare to skill how you’d like according to your needs, I’d personally recommend building this player to be your defensive sweeper, taking skills designed to help him get the ball off the opposition. You have to, and I’d recommend at least 6. A great skill for those offensive linemen when you’re playing any of the stronger teams (Ogres, Undead, Khemri, Chaos etc) as it lets you get that first block in and make it count without needing excessive numbers of assists. Don’t waste it on defensive linemen though, as they can only use it when they do the blocking, not when they’re being blocked. There’s always space on a team for a dirty player, that’s probably what the seventh lineman is for, though I’d say (with my dice rolling) that you’re best fouling late in the game to minimise the impact if you get sent off, but by then it can be too late to make a huge difference. Without doubt, if you’re being blocked this is a good skill, particularly if the blocker has piling on. In my opinion it’s best used if you’re trying to stall a cage, as it prevents the blocker from moving up and making you have to dodge away. Yup, you guessed it, frenzy is my personal favourite offensive skill for the Norse Lineman. Vastly increases your chances of putting someone down, it still needs to be used with care though, and you can be better off not blocking at all if a poor result on the first roll would leave you in the mire. Usually pretty wasted on a lineman unless you don’t use throwers, its main use is for retrieving the ball since you can’t use it to cross the LoS. Some people really like Pro. My dice rolling is just bad enough though that it’s not worth the extra TV in my mind. Could be crucial to minimise paying out for re-rolls you can’t afford and re-rolling the less important stuff (if it’s a block you absolutely must make and need to re-roll it, use a team one, you don’t want to fail your Pro roll, use a team one to re-roll it and then fail again). Linemen generally aren’t fast enough to use this well, except against the slowest (and therefore usually strongest) opposition. Against those players, you really don’t want to be stood next to them too much anyway and they’re not likely to do much dodging except in dire circumstances! Great for that sweeper roll. I wouldn’t bother putting this on anyone likely to be on the LoS because it’s very rare that the ball ends up where they are. Not worthwhile unless you’re looking at making him your main ball carrier, and you’ve got better options for that elsewhere so I wouldn’t bother with this. Absolute gold if you’ve got a lot of dodge in your league. It’s my go-to skill after Frenzy for just about everyone in this team. Worth considering on your defensive linemen if for some reason they manage to skill up. Can create big holes in a defence when used en masse. Magic in that sweeper role – it will force most opponents to try and blitz away from you, and a lot of catchers are weaker meaning you’re picking the result. Always a good option, as it limits the number of occasions your linemen end up on the floor. Not worth it on your offensive linemen though as in this instance it’s a defensive skill. Added to that, if you’re stalling a cage and dodging away each turn, dodge makes it much more reliable. If you build a fouler and roll a double, Sneaky Git will make sure you get the best value for those stamps. An extra re-roll is always good, and it comes in at half the price of the others, but if you’re splitting your linemen into offensive and defensive, you might be better taking it on a player who’s always on the pitch. Manoeuvring opposition players into better positions for blocking them? Yup, good plan, but it’s not the most useful doubles skill. This is. Even if you use your Ulf’s on the LoS, players with Guard make blocking on the LoS or in a scrum so much easier. Take as much as you can, you’ll need it. Always very useful, if you’ve already rolled a ST increase and Frenzy, taking this skill really multiplies your team’s power, you’re effectively building your own extra Ulfwereners! Great for stymieing that cage, but its big disadvantage is that there are several preferable double skills to take on linemen first. Suffers from the same problem as a lot of the double skills, there are better options. Added to that, Nuffle’s Law means that if your opponent does break the armour on this guy, they’ll roll 9 or more for injury. Strength, strength and strength. There’s an argument for taking armour, particularly if you’ve got that Frenzy/+ST/Mighty Blow guy already, but four skills is a lot to get to without them dying first. Alternatively, if you roll Armour first, you could take it to make sure that player stays around long enough to get those other skills. I’d be inclined to take the skill above anything but strength though in general. Depends on the role you want them to fulfil, but I have two general paths I try to follow. The Offensive Lineman is basically there to become another blitzer (or several more since the basis of the player only requires general skill access – Mighty Blow and Guard are useful additions but the block/frenzy/tackle trio is the most important part. The Defensive Lineman is only created when I roll a double for the first skill, because regardless of whether I’ve got any of the other skills, I want my defensive linemen giving assists to each other. I’ll cover turning defence into attack in a later article, but it’s enough at this point to know that you only really need 1 Defensive Lineman to start with. If you roll a second double for this guy, take Dodge above any other consideration, as it cuts the odds of knocking him over right down to almost nothing. 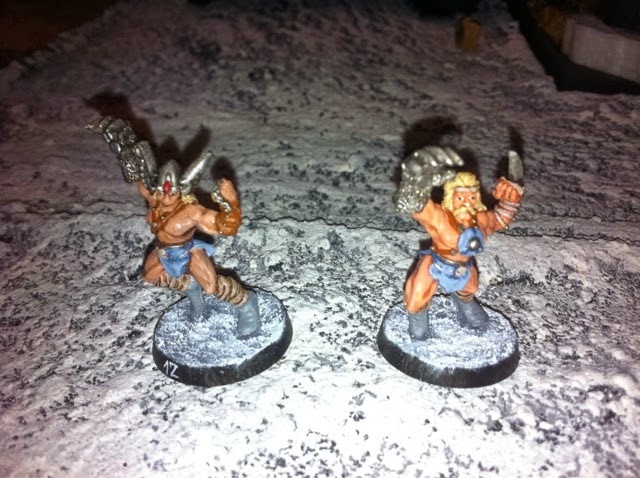 The Norse Lineman is a great player right out of the box, in fact I’d say that for the price they’re absolutely the best lineman you can buy, only Dwarves are better in absolute terms, but at 20k more each and with very restrictive movement the Norse still gets my vote. Hi all, bit of a manic week this week so apologies for not updating my painting progress. 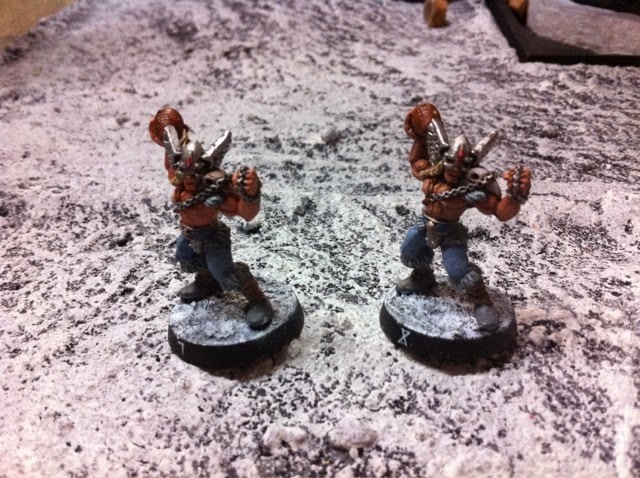 I've got two battle reports for you though from the opening games of the fight for shining falls necromunda campaign. The first was the shoot out scenario I posted last week, and the second game was the scavengers scenario from the main rulebook. I definitely got lucky, as the building I set up with was located at the far end of the street from the other two, who faced off opposite each other. The build up took longer than I expected, with all of us rolling sixes at some point so by the time the salvage snakes (Delaque) finally snapped, they were toe to toe with the goliaths. All three gangs started blazing away, with the snakes doing little damage (actually, they missed a lot considering they were so close to their targets). 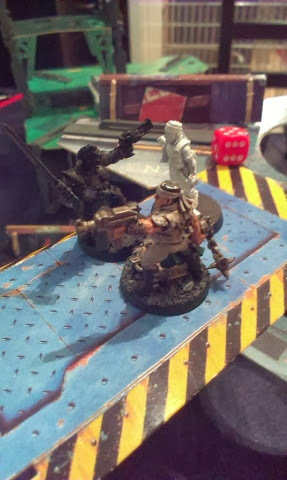 The 78th street smash mob managed to score a few wounds as my Orlocks let rip from afar - both my heavy stubber and a lasgun running out of ammo! At least the shots counted however, with Crank scoring a wounding hit and Vulture’s heavy stubber wounding two of the goliaths. By the end of the fast draw phase both opposition gangs were looking a bit worse for wear, as you might expect following a close range shootout like that. Salvage Snakes had two of their six members down and the 78th Street Smash Mob were also down by two fighters, with only their heavy and a shotgun ganger not lying on the floor at the end of the phase. Dr Hesse of the Smash Mob then proceeded to down the Salvage Snake’s leader, before being in turn wounded by Cillian in a revenge hit, which resulted in the Goliaths bottling out of the fight. Dag of the Salvage Snakes put my leader, Boone, out of action with a long range shot through some heavy cover before Butcher pulled off a similarly tricky long range shot with his autopistol to wound Borris and force the Snakes to bottle out. Victory to the Death Spectres! I’ll admit though, that it was definitely heavily down to my starting well out of the way of the mass firefight in the centre of the board allowing me to watch as my opponents shot each other at point blank range and then mop up the remainder. I was also pleased that I managed to get my poor ammo rolls out of the way in a game where I didn’t need to do much shooting, which definitely paid off in the second game of the night as I didn’t fail a single roll then. The second game we played therefore was the scavengers scenario, with loot counters in the centre of the board giving anyone who could collect them extra income at the end of the game. We used our full gangs in this scenario too, so in total there were 36 gang members involved (both the Salvage Snakes and the Death Spectres having gained a model from their settlements). We set up in the same basic locations as before simply to save everyone moving around, which meant that once more the Death Spectres were defending the Brewery Tap building – apt given that one of their number used to run it! My number was definitely up in this game however, the 78th Street Smash Mob clearly holding a grudge from the previous game where I shot them in the back quite a bit, and they completely ignored the Salvage Snakes, working their way towards my position keeping in cover where possible. The Salvage Snakes themselves kept the truce on the whole, taking the view that of the two gangs facing them, only one was trying to shoot them so they’d focus their fire on that gang. My new Juve (temporarily called Stumpy) went down early, eventually going OOA as he rolled around bleeding out, ending up with a leg wound. Three juves from the Salvage Snakes got a bit careless with their positioning then, ending up close enough for Junkyard, my heavy, to cause some hurt, so I walked into range and let rip with his flamer, hitting all three dead centre. And then I rolled two ‘1’s and a 2 to wound, failing to hurt any of them! Fortunately for me, two of them caught fire, both eventually taking a wound (we decided that we’d use a house rule whereby if anyone who is set on fire is subsequently wounded by the flames, the original firer gains the experience points for a wounding hit). Sadly that still left one guy, who proceeded to charge in and put Junkyard out of action. Fighting on two fronts, Hawg decided enough was enough, and over the next couple of turns he put down two of the Salvage Snakes number before being taken down himself by Chuck as I bottled. 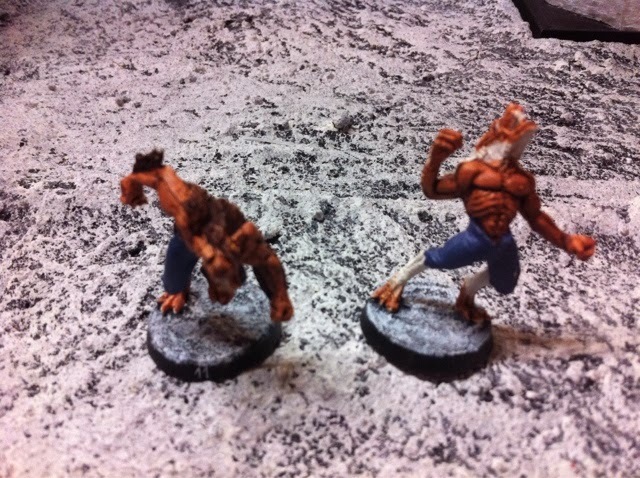 In the meantime, Howard of the Smash Mob wounded Weasel, one of the Death Spectres Juves. Crank, who’d got a BS increase after the previous game, shot down another of the Snakes’ juves who was foolishly running out in the open to claim a loot counter, though Brew and Rebel couldn’t do the same to his companion. Boone then gained a measure of revenge on the Smash mob by shooting down Hercules, who was acting as bodyguard for the flamer toting heavy who’d let rip too soon and failed to hit my leader, making sure of the kill by switching his plasma pistol to the highest power setting. The Goliaths had the last word however, Quaid wounding my last Juve, Maggot, which saw me bottle out and leave the fight. So the truce was over, and a very one-sided affair ensued, the Salvage Snakes were already taking bottle tests thanks to the casualties I’d caused, and the Smash Mob had worked a considerable number of gangers into the Snakes lair. Dutch took down the Snakes leader, The Salvage King, and both Ed and Burnout were taken down by Trench and Dr Hesse respectively. The Snakes slithered away, leaving the Smash Mob in control of the field and most of the loot counters. There was one success story for the Snakes though, their newly recruited Juve (now christened Gump) had run out into the open centre of the table, retrieved a loot counter and made it off the board, being shot three times, all of which failed to wound, escaping being pinned on every occasion whilst keeping hold of that loot counter to add 25 creds to the Snakes income after the game. When the dust settled, my gang had recruited another juve from its two settlement territories, and Junkyard has picked up a gammy leg, slowing him down. Vulture, despite wielding his heavy stubber magnificently gained an extra attack and point of strength, Crank and Hawg are both now BS4, though Hawg suffers from an Old Battle Wound (ok, so I need to get another shotgun guy!) but at least it’s only a 1 in 6 chance of him not turning up to a battle. Other increases result in Boone and Crank increasing their leadership, Boone gaining a set of flak armour and a blindsnake pouch. Crank is also now BS4 and WS4, whilst Butcher is now Toughness 4 and has 2 Wounds (he’s close combat equipped, so I was dead chuffed with this!). Vulture now has S4 and 2 Attacks, so I need to seriously consider turning him into a close combat guy (I’ll probably leave him as he is for now, then re-equip him when I get some more cash). Hawg gained a point of BS from the first game and his heroics in the second game see him go up to Toughness 4 as well – that old battle wound must have resulted in a lot of tougher scar tissue! Brew was my only other model to gain an increase, also becoming BS4 (very pleased indeed, two games in and three gangers with BS increases, all of them armed for shooting). None of my juves turned up to the first game, so missed out on the greater experience available in that scenario sadly, but weasel and stumpy are well poised for increases next time. So there you have it, the opening salvos have been fired in the fight for Shining Falls, and we’re now waiting for the real meat of the tussle to begin. Till next time, remember, Chuck Norris can slam revolving doors.